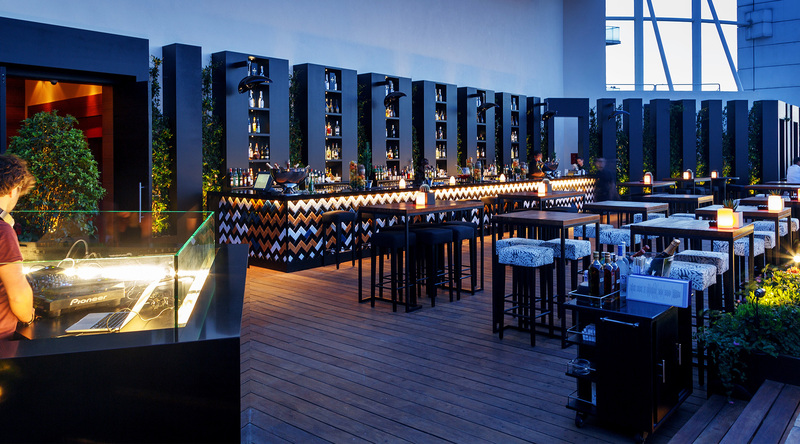 The Pop-Up Lounge Bar at the rooftop of the Four Seasons Hotel is a project designed and delivered in 5 weeks. The efficiency and productivity of the team was at a peak to be able to complete such a challenge at an exceptional location in the heart of the city. 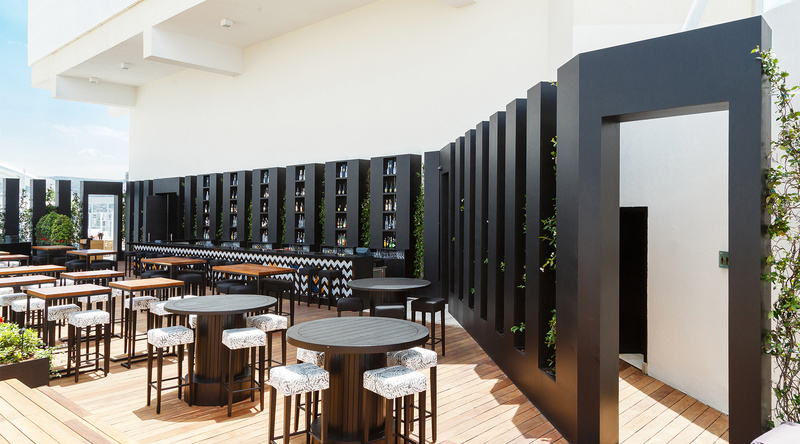 The challenge was to create a distinctive visual approach and a harmonious temporary space – aligning with the aesthetic identity of the Four Seasons Hotel – in the form of a Pop-Up Lounge Bar to be dismantled after five months. The existing rooftop is enveloped by the mega-structure of the imposing Four Seasons Hotel and its 12-meter-high walls. Therefore, the designed installation pulls the space together and brings the Lounge Bar to a human scale, where the sense of comfort and belonging become key components. The new skin acts as a space generator composed of 80 columns from which all the other functions breed. 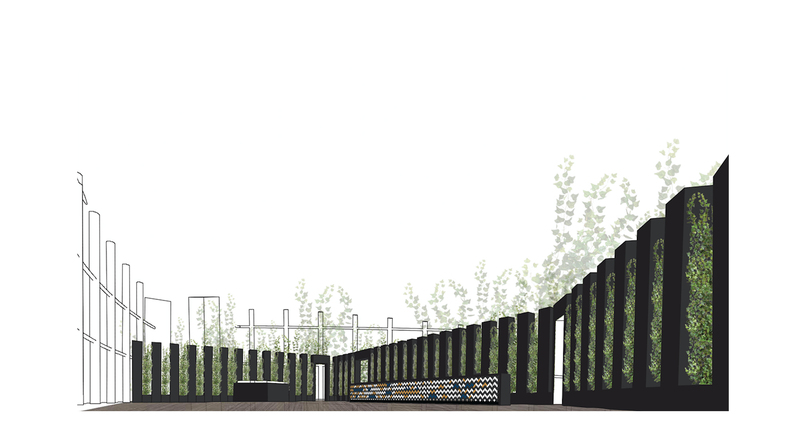 The columns control the space circulation, blocking and freeing passages when needed. They generate the lighting of the space, specifically around the green walls. Those green jasmine plants allow for a visual communication to the pool area as well as a free flow of air circulation on hot summer nights. And finally, the imposing rhythm of these columns form the back bar. 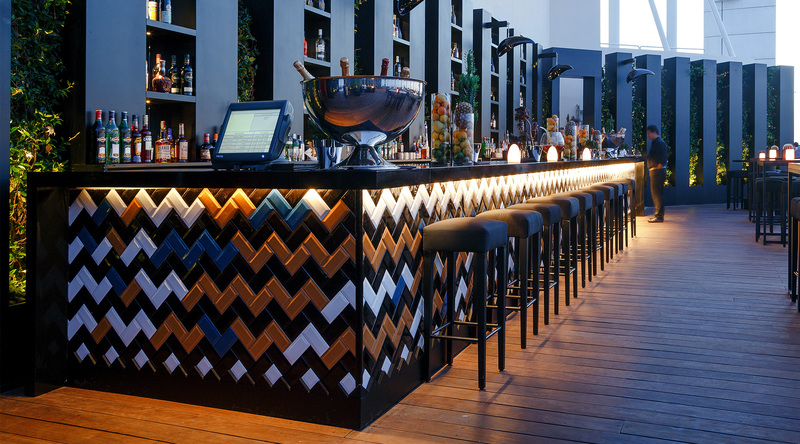 To add a sense of playfulness to a bold installation, the bar’s front elevation is cladded with lit patterned colorful ceramics that inject a mischievous composition. 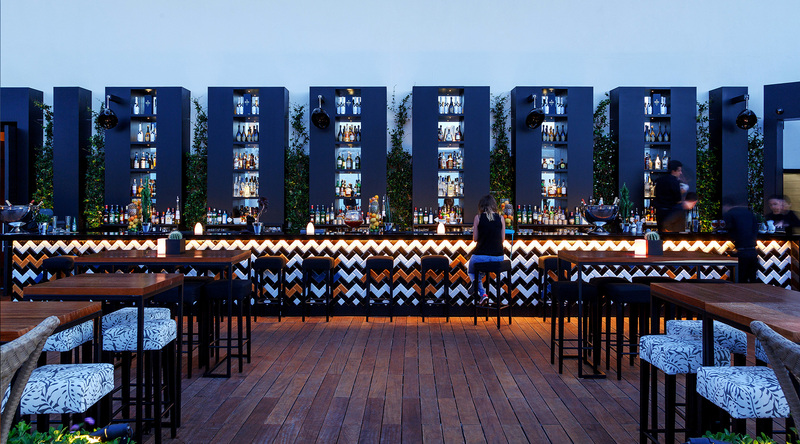 The aim is to make visitors fall in love with the space where they have landed and the attitude of the Pop-Up Lounge Bar that has been envisioned as a perfect place to unwind.